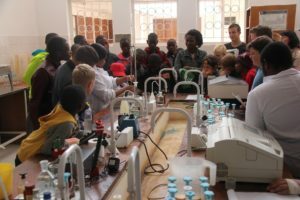 The day-out started with 25 young boys and girls, aged 8 to 16, from the neighboring Ethandweni Children’s Home and homeschoolers from Bulawayo, together with their guardians, seated in scientists’ chairs in the ICRISAT conference room. The students study agriculture as part of their curricula, and all have an affinity for plants and animals, which prompted their guardians to contact the institute to arrange the visit. Jonathan, a curious gardener, likes experimenting with plants and dreams of becoming a botanist. He feeds his chicken with fodder that he grows himself. Carlos, whose career goal is to protect rhinos, also loves pigs. His parents use pigs to rehabilitate degraded lands, enabling crops to grow again. At Ethandweni, the children grow their own vegetables and crops; they also have plans in the future to raise goats. Dr Sabine Homann-Kee Tui introduced the students to ICRISAT, its mission and its ethos that agriculture makes a crucial contribution to rural communities around the world. “Your future is in your hands; live up to your aspirations, nurture and grow through your desire for knowledge.” Dr Andre van Rooyen said addressing them. 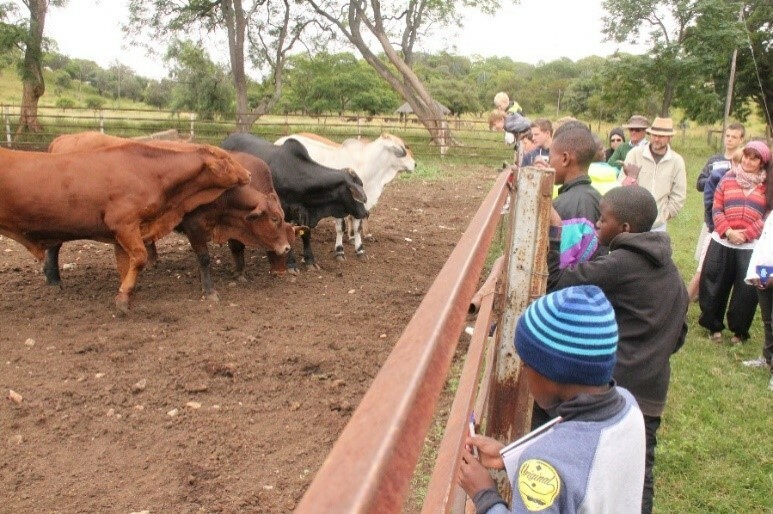 The group learned that Matopos Research Institute, hosting ICRISAT Bulawayo, is the largest research station in Africa with about 28,000 ha land, 2,000 cattle, 600 goats, 100 pigs and 300 chicken, among other livestock. The students also learnt about soils in the ICRISAT soil laboratory where, on arrival, experiments were underway to establish the carbon content of a soil sample. The students saw how ICRISAT measures the soil’s mineral content, particle size and the soil’s natural fertility, so farmers can be advised how much fertilizer they need to add. 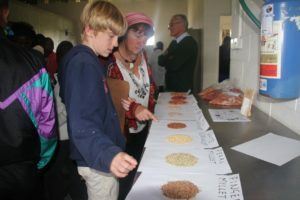 In the food laboratory they learned all about the characteristics of crop grains for good food. In the adjoining lab another type of experiment was being carried out: Recipes to encourage the use of sorghum and millet which, although healthier than maize, have unfortunately lost their popularity in modern diets. A loaf of bread was baked using sorghum instead of wheat flour and analyzed for its nutritional value and visual appeal to consumers. Sorghum and millet digest slower in our bodies, giving us a feeling of being full for much longer, achieving less weight gain and more nutrition. During the field visit, the students also learned about crop breeding. At the pig and chicken pens at Matopos Research Institute, the students were taught how the livestock naturally rehabilitate degraded land: Free range pigs and chickens, on rotational grazing, improve soil fertility through their trampling and feces, without chemical fertilizer, prepare land of poor soil quality for subsequent crop growth. The children showed great interest and expressed a desire to come back to see the impact of intensive grazing on grass and crop regrowth in the next rainy season. Next the students went on to tour the cattle and goats: Big money, they were told. Cattle and goats are critical in drylands as they provide farmers with income and food security when crop harvests fail. The station keeps different breeds, indigenous and exotic, to test and develop their best traits in terms of adaptation to the environment, reproduction and meat production. Of particular interest was the maggot production. Maggots are raised in the residues from livestock production. 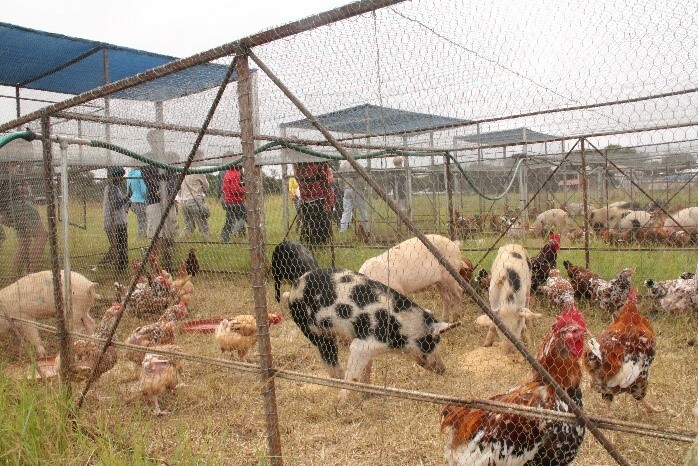 They can be grown at low cost and provide high-quality chicken feed. “The visit had been extremely inspiring, with the students enjoying an interesting morning during which we gained a great deal of knowledge, invaluable hands-on information on nature, food science and livestock,” said Hayley. Various visitors were keen to start growing their own sorghum, millet and groundnuts. They wanted to try out smart food recipes and switch to sorghum porridge for breakfast. The group plans to have a review meeting, sharing all the knowledge that they learnt with the other families that could not make it.